Take a tour of Star Song 1, our West Virginia cabin vacation rental near the New River Gorge, Near the New River Gorge, Lewisburg, Fayetteville & Beckley. Our “gingerbread house” was lovingly built by a local craftsman. 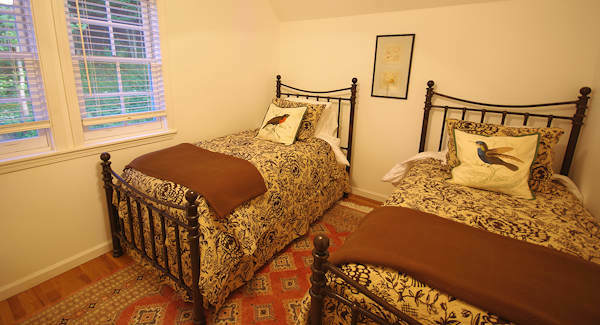 It includes hardwood floors throughout, central heat/air conditioning, linens and towels. Non-smoking. Also see one story Star Song 2 Cottage. 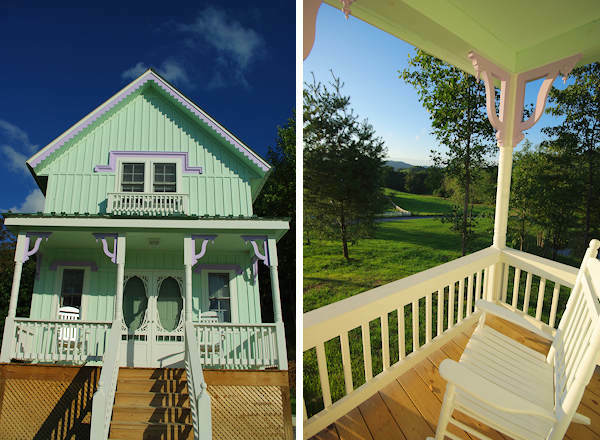 The cabin is perched on a hillside overlooking the pond. Reserve now: 304.484.7711 or Click here to Email Us. The living room includes a comfortable sofa, chair, DVD player and flat screen television with DirectTV “deluxe” package that includes premium movie channels. We also have a DVD collection of recent movies for you to enjoy. Non-smoking. Our dining room table seats four. 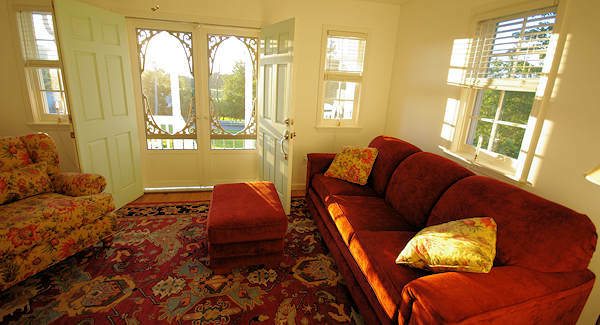 A perfect place to plan your day or enjoy a game of cards. The half-bath downstairs features a porcelain bowl and counter created by a nearby potter. 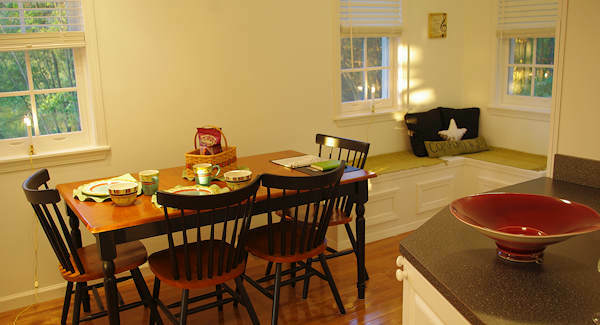 The fully-stocked kitchen includes a full-sized refrigerator with bottled water, microwave (with popcorn), stove/oven, toaster, coffee maker/grinder, blender, cooking pots/utensils and dishes/glasses. 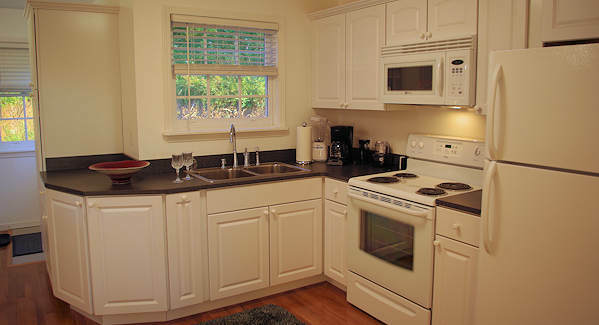 A full size washer & dryer is located adjacent to the kitchen. 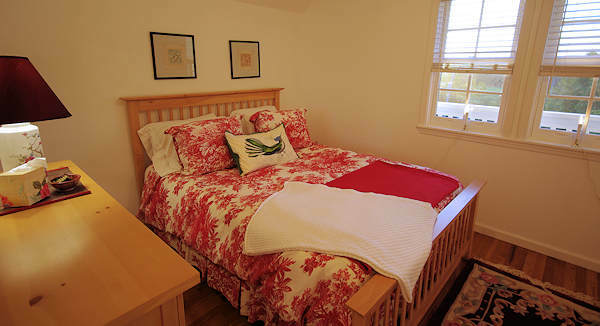 The front bedroom features a queen bed with down comforter, TV/DVD, ceiling fan, closet and nice mountain views. Designer touches grace the cabin throughout. 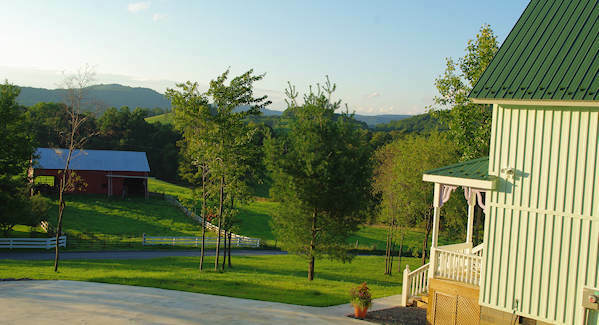 Watch the sunset over the West Virginia mountains and farm wildlife from your cabin porch. This cabin is pet-friendly! Cabin Rental Rates: $160/night or $920/week. Call us at 304-484-7711 or email us for availability and reservations! See nearby things to do in the New River Gorge of West Virginia. Why the name”Star Song”? “Star Song” is a discontinued pattern of crystal made by Fostoria, a regional glass company that continues to produce beautiful glassware. Jim and I first met at the lighted star on top of the mountain in Roanoke, Virginia. We then selected “Star Song” as our memorable crystal at Replacements in Greensboro, North Carolina. Both of us are fond of many styles of music, our food for the soul.